Thanks to Martin Ross for today’s guest post. If you are interested in guest posting with IShouldLogOff, email us at info [at] ishouldlogoff.com. Thanks! The Castillo Hotel Son Vida, a 13th century castle with stunning views of the bay of Palma is the definite place to stay if money is no object. Surrounded by golf courses and sub-tropical parkland, this hotel has earned all of its five stars without question. Or, for those of you that like to indulge in total relaxation, why not stay at the Marriot Mallorca? This hotel is home to the most renowned spa facilities on the island and is only a stone throw way from local beaches and historic villages. The hotel rooms are also extremely impressive with breathtaking views of the ocean. If hotels are not for you then fear not. Mallorca is home to a wealth of varied and exciting places to stay. For total tranquillity, the Puig Sant Salvador in Felantix, a former monastery, has opened its doors to tourists. La Creveta, a charming converted farmhouse in Pollenca is also well worth consideration. With a private pool and within walking distance to fabulous tapas bars and dining places, this is perfect for the ultimate chill-out. The villa of Fin es Fasser is equally stunning. Situated in the small village of Calogne, this villa boasts a large swimming pool, a beautiful, roomy dining room and is perfect for a family holiday. So there you have it. Whether you are looking for hotels, villas, converted farmhouses or renovated monasteries of all things, Mallorca can offer it all. Typical tourist spot-maybe. Unsung gem of the Mediterranean- definitely. Before we left on this journey we hosted some couchsurfers from Malaga, Spain. He was a chef, so when they told us they wanted to make tortilla espanola, I was all for it. Peel, cut and fry potatoes on low heat. Remove from heat. Whip eggs and mix with the potatoes and salt. In another fry pan, put a little oil and pour in the egg and potato mixture. Cook and serve. Blend all ingredients together. Serve. Them: You’re going for San Fermin. Me: Why else would I go? Them: (not answering my question because clearly there was no answer) Be careful. So we went. Flying first to Barcelona (that was the cheap flight) and spending a very brief night with an old friend we boarded a bus the next day for Pamplona. We arrived in the evening, after the opening festivities, and felt as though we’d missed the entire party. Everywhere we looked were people dressed in all white with only a red neck-scarf and belt. Many were covered in sangria and were already leaving town. We quickly purchased some overpriced apparel and were on our way. Sitting down at the home of our host we were basically given a primer in running with the bulls; which parts of the course were more dangerous, which better for viewing, and which easier to survive for another day. We learned that last year someone died, but that death is actually quite rare for the event, and that it was important to be well-rested and sober. It was already midnight, one person in the house was filling an “exterminators” spray bucket with sangria and setting off for the night. Others were turning in so that they could wake up at 3am to get to a good viewing area. Only one of that foursome was planning to run. In the end we woke up at 6am and within an hour I found myself in the ‘path of the bulls’ ….with time to spare. I set to walking around and trying to make myself comfortable in the cool morning air. Walking toward where the run began I found more space as this was the safer, and therefore less exciting area to be in. At this point in the run the bulls are mostly together and sprinting forward having not yet come to their first corner where they might lose the group, become disoriented, or slip while turning. Any of those situations can become dire rather quickly. I watched as bands played music, old men danced, young men performed stretches and other ‘primadonna’ type rituals, and women laughed and joked from the balconies. Soon it was time to get excited. A noise came from the front and tons of people started running…..even though there was at least 10 minutes left before go-time. Same thing happened again at 5 minutes. People wanted to get further down the track for their chance to enter the bullring I suppose; or maybe they were just stupid and thought the bulls were running after them. Men at the front began to chant a song that I couldn’t understand while striking their rolled up newspapers in the air. There was a rocket blast, cheering, more running, a first glimpse of bulls, then pandemonium. With the bulls past already, it really did last only a mere instant, I didn’t really know what to do so I kept running/walking in a somewhat forward direction. Eventually I heard the now familiar sound of a cowbell and knew that some others were coming and indeed they were and did. This grouping of bulls seemed to miss the memo titled ‘Running with the Bulls’ as they were merely trotting yet still dangerous all the same. With them past people joined together in that same forward motion, looking over their shoulders the entire time, and began to sing ‘ole, ole, ole, ole, ole, ole.’ (It sounds better when you sing it, doesn’t it?) I made it all 850 meters to the bullring, which was already closed, and then left the street to go meet Jill at our meeting place. It may have only lasted a matter of seconds, but I ran with the bulls. Now enjoy this video from last year. The man who is absolutely destroyed by the bull not only lived, but ran again this year…he’s a local. Cuidado, caution, indeed. 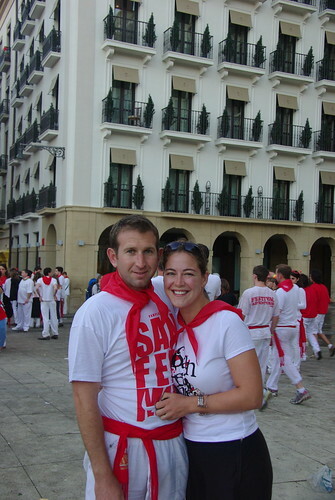 We arrived in Pamplona on the first night of the nine night festivities. With the first “encierro” or bull run the next morning, Danny decided he might as well try his luck on the first day and just get it over with. Danny’s going to write about his experience with the encierro later this week, so for now I’ll just leave you in suspense. 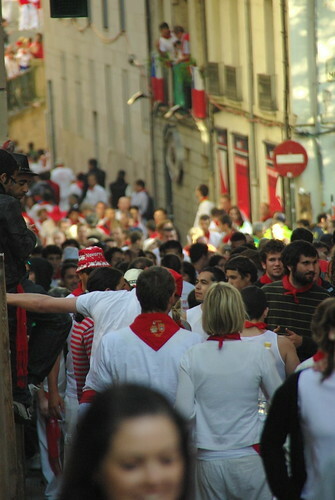 Besides the famous encierro, which happens every single morning of the festival, San Fermin is also regarded as the biggest party in Europe. Staring July 6th and ending July 14th, the festival is one easy math equation: sangria+bulls= craziness. All night bands and bars do their best to keep nearly a million people happy and drunk over the nine days of the festival. The median age seemed to be around 18 although there were lots of people our age and older, we felt slightly out of our element. That’s not to say we didn’t enjoy the festivities, but we couldn’t hold a candle to the younger folks. For the last five hundred years, the encierro ends each morning in the bull ring, where the enormous bulls that have just run down the street are corralled and escorted from the ring as quickly as possible. Left in the ring are hundreds, maybe even a thousand battered, frightened and exhilarated people who have survived the running of the bulls. They are waiting for what can only be described as payback. Now I’ve never witnessed a gladiator competition, but if you’ve seen the movie you might have an idea of what if feels like to be in the ring. With the big bulls safely out of the picture several smaller bulls, with their horns covered to prevent goring, are released one at a time into the crowd. The doors are closed and the same people who just ran for their lives down the street try to attract the attention of the bull with colored shirts, newspapers and clapping. Some people try to jump the bull or even torment it but the handful that literally try to grab the bull by the horns, are punished quite severely from the crowd of locals and beaten until they let the bull go. Although participants can’t be gored by the bulls, the bulls are still quite strong and can knock people down, toss them into the air, charge them and even run them over. 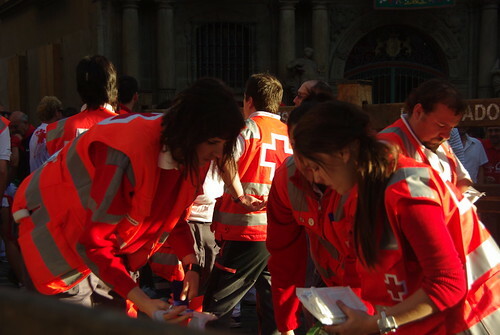 On the day we sat in the bull ring two people were pulled out of the run for medical attention. As you can imagine, people don’t tend to stay in the ring for too long and by the third bull the crowd had cleared considerably, with most of the “runners” relegating themselves to watching from atop the wall or behind a safety barrier. Brutal. The action is primitive and absolutely horrifying and yet, electrifying. Cheering, jeering and wincing at the action, the crowd is just as much as part of the action as the bulls, probably even more so. It’s like watching a sports game in a crowd of a few thousand people, a very frenzied crowd of people. 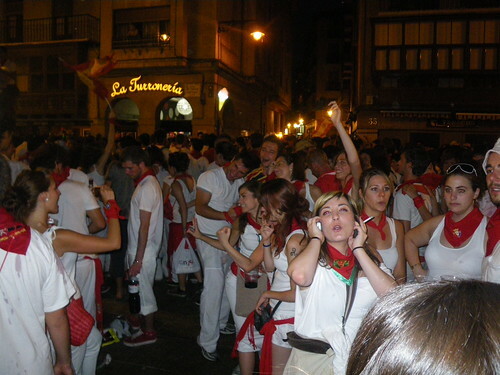 If you go: San Fermin runs every year from July 6th-July 14th, and nearly a million people are estimated to attend. Book transportation and accommodation early. The encierro happens every morning of the festival starting July 7th at 8am, but in order to participate or spectate you’ll have to be there much earlier. Follow the rules of the encierro, which are posted all over town, and remember not to participate drunk or drugged. 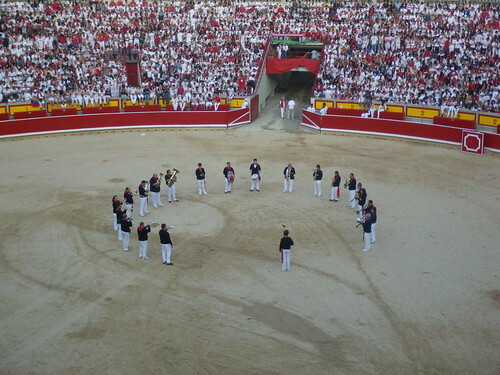 Bulls that participate in the encierro in the morning are killed during a bull fight in the evening, tickets are available at the bullring in advance.